Panevezys (Ponewesch) overprints on Soviet Union stamps issued during German occupation of Lithuania during World War 2. This example of postal history offers the rare 60k stamp with green overprint, plus a complete set with violet overprint (all 4 values issued with violet overprint: 5k, 15k, 20k, 30k). The 15k stamp is the scarce variety with open "Y” and squashed “Z” in Panevezys. A superb selection of 5 stamps, on a beautiful antique photo postcard (printed in Lithuania by “Spindulys”). 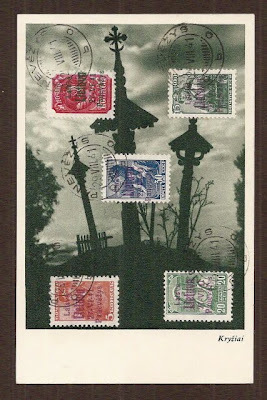 The postcard itself is probably quite scarce as the Soviets suppressed religion and religious symbols (photo shows hilltop with old wooden crosses famous on the Lithuanian landscape). Stamps are Michel numbers #4c, 6c (variety), 7b, 8c, and 9. Each stamp has corresponding expert hallmarks on the back side of the postcard (Krischke BPP and Klein BPP have authenticated each stamp). Michel catalog value of these stamps as used on cover is €1150 = $1650. A magnificent piece of postal history.